I’m On A Diet. A Food Spending Diet, That Is. I’m feeling it. I’m sure you are, too. That’s why after reading Amy Dunn’s article, I decided a “food spending diet” was in order for me. I took an inventory of my “pantry” and decided I have at least two weeks of meals waiting to be prepared, I can eat well on $10 of fresh produce a week, and I don’t need to eat out. So yesterday, I paid for my last meal in a restaurant for at least two weeks (a lunch date with my daughter and her boyfriend) and committed to eating only food I prepare or someone else prepares or pays for (like a “real” date, which isn’t likely…lol). I went to the grocery store and spent $9.54 on spinach, blackberries, a grapefruit, bananas, onions and a mango. I already had frozen fruit and veggies in the fridge, so I should be OK for produce through Saturday. It will be fun to get back in the kitchen again. I’ve been woefully neglectful of the culinary arts, lately throwing meals together haphazardly and subsisting on omelets, PB2, yogurt and salads. Not that there’s anything wrong with those things, but I’m more creative than that, and god knows I have the time. Besides, I like my kitchen. I like to cook. It relieves a lot of stress. It also gives me a chance to catch up on my music listening. I put on Pandora on my computer in the “dining” room (which actually has no table; I eat at my computer or in the living room. I know, I know…but I’m mindful, really I am). Then I chop and mix and bake and clean up. It’s all very cathartic. Back to food spending. In the mail Thursday was the Penny Saver (that’s how I know it’s Thursday). I’m a coupon cutter, but only for things I already use. This week’s best deal is from Save-A-Lot (a wretched excuse for a grocery store): a free carton of eggs. No purchase necessary. I go through eggs like g-baby Maelie goes through diapers, so I’m all over that. Some of the meals I’ll make will include brown rice, wild rice, quinoa, beans and canned tomatoes. I have a half pound of dried pinto beans so hello refried beans! I made horseradish hummus on Friday, which will last a few more days (recipe below), and I have another can of garbanzo beans to make it again to take to my friend Debbie’s house Saturday night. I have four servings of lentil soup and five garbanzo bean burgers in the freezer. Since my divorce, I haven’t broken the habit of cooking a full batch of soup or whatever, thus I only eat three or four of the six or eight servings. This “food spending diet” will hopefully help me break that or at least keep me mindful next time and cut the recipe in half. I’m still new at the whole cooking for one thing. So…have you had any food spending challenges lately? 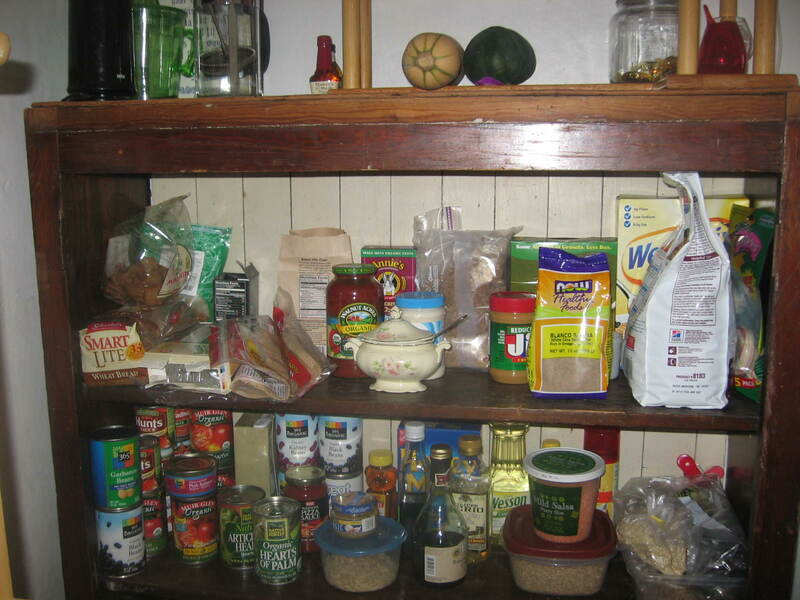 Could you eat healthily from your pantry if you had to for a week or two or three? If you’re looking for more money-saving tips, check out one of my favorite bloggers, Cammy from Tippy Toe Diet. She shared some of her favorite money-saving sites in last week’s blog, “Frugal Friday“. I totally forgot I had an eBates account until I read it! And Groupon is awesome. Wishing you a frugal February! Place all ingredients in a food processor and process until well combined, adding bean liquid as needed (I usually use about half of it). I do a taste test halfway through processing to see if it needs salt or more pepper or horseradish. Chill in the refrigerator for at least two hours. 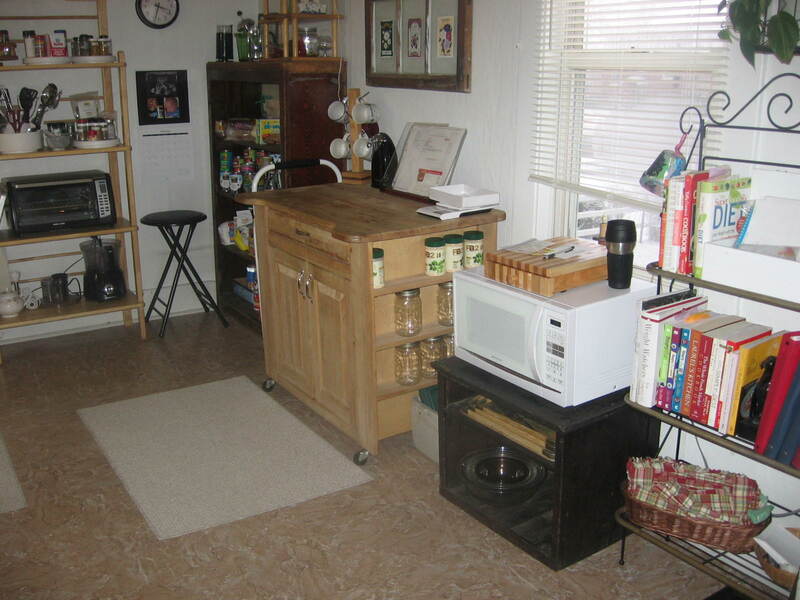 This entry was posted in Food and Recipes, Weight Maintenance on February 21, 2011 by Lynn Haraldson. 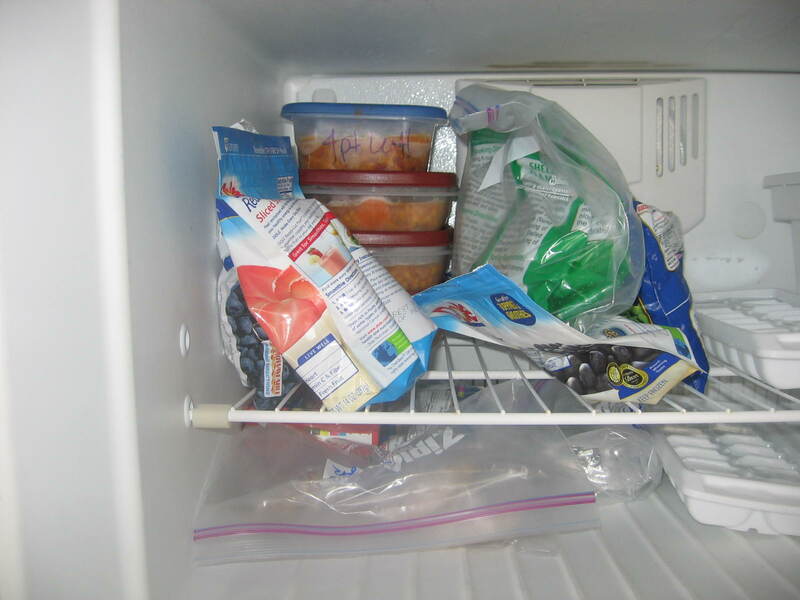 Your freezer looks so empty LOL! I used a lot of frozen veggies, and of course, I eat meat so after a trip to the smokehouse, our freezer is quite full. Now that football season is over and our weekly dinner bets are done, John and I have one less meal out a week. I need to do that! Especially since I'm unemployed currently. Lol. Good idea Lynn – thank you for sharing! Thanks so much for the mention, Lynn! About a year ago I had come across that term, 'going on a spending diet' and it struck me well at the time. I went through everything in the kitchen — and vowed not to buy ANYTHING (except perishibles)until I first used up what I had. Another thing I did about 4 years ago when I went through all the food in the house was to throw out anything and everthing that had 'hydrogenated' anything on the label. Got rid of that bad trans fat stuff. Thanks for your great post and photos. Oh — and I too, and my husband eat at our computer desks all the time. Every meal, unless we have company eating at our place (not very often). I love eating at my desk — it is relaxing and we both enjoy our net surfing on our individual computers as we eat our meals. We don't 'snack' between meals though. So it isn't just something that singles do. . .
Oh, this sounds fun, Lynn. And actually something I need to do. I think it'll be my next challenge after I am done with my 'no dairy' challenge. And it'll make me use up some of that stash in the freezer! BTW, I noticed you didn't buy lettuce. Was it for the same reason I didn't buy any yesterday–the price seemed so high. So I bought the spinach that was on sale instead. Debby, I confess I never buy lettuce. I only eat spinach salads. So I have no idea what the price is, but maybe I don't want to know? I'm glad you wrote a post about this, because I need to do this also. My pantry is too full, and we eat out too much. Good idea – I think just a good clearing out of pantry/freezer food is in order a couple times a year at least. I keep a monthly budget and just started weight watchers–so I anxiously went out shopping, but broke my monthly budget on food. My refrigerator is overflowing and my freezer is full. I believe I can plan enough meals for the rest of the month-and look to $10 a week for perishables. Ensure you consume some protein every day, preferably at every meal. It is vital for your health and it will benefit your exercise efforts. I've just started my weight loss journey. I'm about 2 1/2 weeks in. I'm blogging about it too. I really like your blog. It's nice to be able to read one by someone who has lost and is maintaining. I was wondering if you have any advice on how to eat healthier on a budget. I feel like my food spending has gone way up since I made a commitment to eating healthier. Nice I have to try this one. Usually I go to Sam's or Costco once every three months and I pack the house. My wife usually watches as I shop because she says im better a saving then she is. I think she just wants me to be in the grocery story (lol). The thing is that I have found the we don't need to go the grocery store if we actually prepare the food that is in the house. So often people buy something when they have food that they can eat at home. Its both a waste of money and calories.